Well, the big plan at the Easter weekend was to get through all 30 episodes of Twin Peaks. It didn’t seem like such a tough challenge at the time. However, I made it as far as episode 13, Demons, then had a call a halt to the experiment. The first season was actually really good, and seemed to have a larger budget for outdoor shooting, which made the whole show seem more expansive. There’s also absolutely nothing wrong with Agent Dale Cooper and his quirky approach to investigation techniques. He’s actually the only reason we kept watching as long as we did. For a while, it was a great ride. I loved the OCD stacking of donuts, the strangely chic dancing by adult straight men, the oddness of the town did draw me in at first. But, it was also its worst feature. Because it’s not the early 1990s anymore, and the soap opera elements began to stink. Also the music really started to grate. The cheesy acting went from endearing to relentlessly bad. It seemed that, after the terrifying references and appearances of Bob, and the mystery surrounding Laura Palmer’s murder, things sort of slowed. Right. Down. It was the third full day of watching Twin Peaks when we cracked. I’m sorry, I will continue trying to complete the show, one at a time, with breathing space inbetween. But this weekend, meant for relaxation, was probably not the ideal time to race through 150 hours of a show created by David Lynch. I read around it, and it just didn’t sustain the weirdness long enough. I’m pretty sure there’s some good stuff coming, but again, we’d reached our Twin Peaks saturation point by midday Saturday. Also, we’d run out of Tunnock’s Caramel logs. Disaster! We ended up watching all of Season 1 of Breaking Bad, and most of Season 2 instead, and actually LEAVING THE HOUSE once or twice. Then it rained over the entirety of Bank Holiday Monday. But that was OK, too, by then, mental balance had been restored. I definitely think I’ll return to Twin Peaks, and before the year is out as well. This exercise has proved that, watched in a lump, one after the other, the show is just not that interesting. Or maybe I’m missing something. I know the show had some problems in Season 2, and that’s a pity as well. I still love Agent Cooper, and can’t emphasise that enough. I’m also grateful that this show opened a door to quirky in everything from the X-Files to Buffy. Spotting Scully’s Dad in this was a treat and I still haven’t seen Mulder in Peaks yet, so I will be going back for that! Instead, I got on with other writing, reading and capturing the last of the weekend. Lesson learned. Normal service will resume this week on the Haunted Eyeball. Twin Peaks is a show I thought I’d ruined for myself by watching all those ‘top ten’ list shows and too many curious scans of wikipedia. So, now it’s all on Netflix in the UK, it’s time to mak the best use of the Easter weekend by, er watching all of it. Probably for the one and only time, so the plan is to make the most of it. We are stocked up on Tunnock’s Caramel Logs (they’re called biscuits in England, and seem essentially the same as the ‘logs’). We’ve made some damn fine coffee (French blend, oh yes) and the cherry pie is on standby. Now I’m trying to entirely forget what details I know about the show, and enjoy this iconic surreal melodrama in its entirety. Nothing much happens at first. Poor Laura Palmer is discovered on a lakeshore, wrapped in plastic. The music already bugs me. Yes, poor Laura Palmer is dead. And the grief in the community is palpable. A cop called Andy cries buckets over the situation. Everything takes a looooooong time to happen, I think there’s always a problem with pilot episodes, but this one was suffering from 1980s TV show pacing. I hate the two teenage boys. There are a lot of people to keep track of. When Kyle Mclachlan’s preppy Agent Copper finally shows up the show really bursts into life! He is definitely the draw for this show. He’s so enthusiastic about the location. He loves trees. He loves the snow bunnies. I spend the whole episode waiting for him to mention the ‘damn fine coffee’ and it never happens. Disappointment! If this show was made now, there’s a good chance he’s the first character we meet. As it is, he’s definitely worth the wait. Then the episode ends in terror. Mrs Palmer has a vision. A weird gnarly guy with lanky grey hair is lurking and leering at the foot of Laura Palmer’s bed. Eeeeeeeeeee. The two douchebags are in jail, and so is the other boyfriend with the puppydog eyes. There’s lots of talk about drugs, and Agent Cooper finally says he loves that Damn Fine Coffee, and eats a great deal of cherry pie. Yay! We also meet log lady properly. Robocop’s creator shows up (Bob Morton!) and Agent Cooper has to stop the rest of the law enforcement officers from decking him. Cooper also uses a unique method, inspired by Tibet, I think, to narrow down the list of murder suspects. It involves a rock, a blackboard, and a glass milk bottle. It’s also accurate. We learn about the existence of a seedy club called ‘One Eyed Jacks’ where gambling and hookers dressed like frilly anime girls (with a deck of cards theme naturally) are available to the Audrey’s dodgy dad and his brother. Then Agent Cooper has a very weird dream set in a red room with a backwards-talking, dancing midget and a woman who whispers the name of the killer in his ear. He won’t say who it is until breakfast the next day! The titles end with more midget dancing. Awesome. Agent Cooper only kind-of knows who murdered Laura; he and the cops must decode the finer points of his very strange dream. We learn there’s a secret society called ‘the Bookhouse Boys’ set up to combat a dark presence in the woods, which sounds a little like Stephen King’s IT, actually, if The Losers Club were organised. It’s also very funny and tragic hen Laura Palmer’s grief stricken father won’t let go of her coffin – there’s no way that scene isn’t meant to be hilarious. The hunt is also on for the one-armed man. Also, I could care less about the power games at the Mill, although I’m sure that’s going to be important later, and Piper Laurie is fantastic. They actually find the one-armed man, and the conspiracy about the mill and Audrey’s attempts to woo Agent Cooper continue. The episodes seem to be ending quicker and quicker, which is a sign we’re getting into it. At this point, it was bedtime…. Agent Cooper – Kyle McLachlan is very funny, who knew? Why is he always cast as a kooky stiff? He’s great here. Amy – Love her squeaky voice and OCD stacking of department donuts. Log lady – I gather she’s important? Want to know more! what does that log have to say? Ed – The big faced, tiny-nosed guy is having a clandestine relationship with RR Diner owner, Norma. His drape-obsessed, eye-patch wearing wife, Nadine, is NUTS. Josie – that lady can carry off the early 90s androgyny. Leo – big ol’ psycho, wife beating nutcase. I have a hunch he’s out to die soon, but who is the guy all dressed in black, hanging out with him in the woods? Audrey – Flirts, sulks, sort of great and pushy yet irritating as hell. Really resembles Marilyn Monroe and she will probably grow on me. So, now we’re over halfway through the first season, a few thoughts. 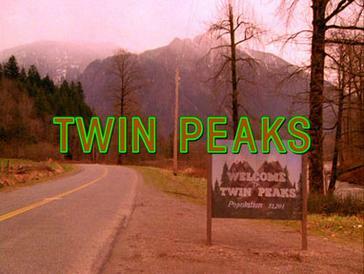 Twin Peaks is slower paced than I was expecting, but it looks beautiful on HD. There are a lot of characters to get used to, but I do want to go back there. It’s a strangely absorbing show and Kyle McLachlan is fantastic as the boyish oddball FBI agent. In fact, he reminds me of Benton Fraser, the Mountie from Due South, which also channelled the surreal in the name of fighting crime. There’s a lot to take in. More will be viewed over tomorrow. I think we’re gonna run out of Caramel Logs before too long! Also, gotta get some donuts in, and stack them appropriately. Probably on Saturday’s viewing. Plans are afoot to watch all 20 episodes of David Lynch’s notoriously surreal drama series, Twin Peaks (1990), over the Easter weekend block. I was born slightly too late to appreciate or even remember it when it was first broadcast, (I’m from the slightly later X-Files era in 1993) but I am looking forward to finally seeing what all the fuss is about. This show is referenced in Witness, for crying out loud, it’s where I first even heard about it. Not sure just how big it was over here in the UK, either. Was torn between doing a minute by minute recap of all the episodes as they appear (while realising I’m never a big fan of reading those lengthy scrolling entries, so probably not). Instead I’ll be summarising my response to each block of episodes at the end of the day’s viewing. Gibbering will be kept at a minimum, I hope. That ought to do it. That should leave most of Monday free for fresh air and blinking in the bright light of the external universe beyond our sofa. I haven’t tracked down a copy of Fire Walk With Me, the film prequel to Twin Peaks, yet. I did it see many years ago, but think we’ll stick to the original series for now, care of Netflix. Apparently there’s also a drinking game – one Google search later, it turns out there’s a boatload to try out. That’s to be decided later, I reckon. Any recommendations are gratefully received. So we’ll be putting in the supplies order for Thursday and dodge the panic buying for the Easter Bank Holiday starts. I love supermarkets that deliver! With this, and nothing too complicated to cook, the Haunted Eyeball will soon be reporting on its adventures in with Agent Dale Cooper in Twin Peaks.